The subject of side dish recipes could warrant an entire website on its own. Think about it for a second. Think of the recipes that are typically guarded like gold at Ft. Knox. It's the side dishes. Go to any BBQ festival and one of the most discussed subjects are great side dishes. Do you have a cookbook handed down from generation to generation within your family? I'll bet a lot of those recipes are side dishes. Do You Have a Fantastic Side Dish Recipe? Share It With Us! Share it with us by filling in the boxes below. It's easy, and you'll end up with your very own BBQMyWay web page that visitors can comment and rate your recipe. Top recipes will receive some awesome BBQ sauces and rubs. Your side dish could be a vegetable, salads, casseroles, appetizers, any home recipe you think makes your BBQ experience complete! If you have any questions on how to submit your recipe, just click on the "?" question marks. Enter The Name of Your Side Dish Here! 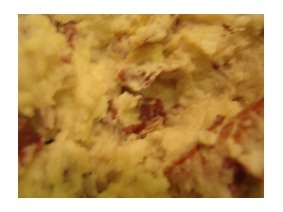 Your recipe will appear on your own BBQMyWay.com Web page exactly the way you enter it here. The more specific you can be about the ingredients and the preparation of your side dish, the better! Do you have a picture of the final dish? Great! Click the button and find it on your computer. Then select it. What Defines a Great Side Dish? Speaking for myself, a good side dish is a recipe that can literally stand on its own, like the garlic smashed potatoes you see in the picture above. It's hearty with lots of flavor, and will match up with any main dish....aka "comfort food." Green bean casserole is great comfort food and, and everyone has their own twist. Corn bread with personality can be considered a side dish. What about grits? Absolutely! What doesn't count as a great side dish? Simple. Salads and grilled vegetables. Don't get me wrong, I love both of those categories, but this section of the site is all about the hearty, fulfilling genre of great side dish recipes! My goal with this section of BBQMyWay is to accumulate a minimum of 100 fantastic side dishes. Leave Side Dish Recipes and Return to BBQMyWay Home Page.